Charleston, S.C., along with Savan- nah and Brunswick, Ga. This acqui- sition will enable Ryan-Walsh to enhance its current operations in the ports of Charleston, Savannah and Brunswick. Specific terms of the transaction were not disclosed. Ryan-Walsh operates in 24 ports in the South Atlantic, Gulf Coast and inland waterways system. Services include stevedoring, material han- dling, terminal operations and lo- gistics management. Ryan-Walsh is a subsidiary of the Pittsburgh- based Vectura Group, Inc., a pri- vately owned holding company with annual sales in excess of $300 mil- lion. Vectura's other principal oper- ating unit is National Marine, Inc., a barge transportation company operating from New Orleans. Design Group of Seattle, Wash. The mission of these boats calls for a load of equipment that is rare aboard small craft. There will be sophisticated sonar, the "area point search system" (APSS), a "remotely operated vehicle" (ROV) and Mark 16 "underwater breathing appara- tus" (UBA). The Mark 16 is a he- lium-oxygen system designed for low acoustic radiation and minimum magnetic influence, an indication of the kind of work that is planned. The EODSC MK2 will have a length of 65 feet 8.5 inches, a beam of 18 feet 10 inches and be powered by two 450 shp Detroit 8V-71TI die- sel engines. There will also be two 40 kw, 450 V, three phase Detroit 3- 7 IN diesel engines which will serve as service generators. In general, a suspected explosive object will be located by the towed- array APSS, then pinpointed and identified by the ROV. EOD divers will then either detonate it in place or neutralize it, after which it may be safely recovered. These unusual craft are being constructed by Oregon Iron Works which usually builds large shore side metal structures. Their staff devel- oped tooling and methods based on general metal fabrication practice combined with rigorous quality con- trol measures. Isabella, which is the Flender 1600. The deadweight is 30,000 dwt. De- sign speed is 19 knots. B & W 7L 60 MC crosshead engine with a rating of 11.550 kw at 115 rpm. Power transmission is direct to a controllable pitch propeller. Delivery of the vessel is sched- uled for June 1992. 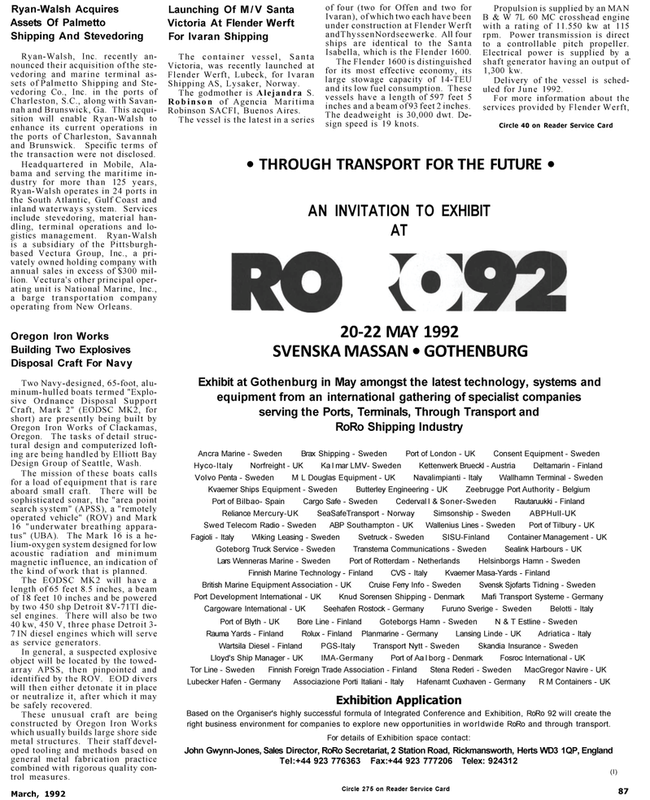 Based on the Organiser's highly successful formula of Integrated Conference and Exhibition, RoRo 92 will create the right business environment for companies to explore new opportunities in worldwide RoRo and through transport.